Well, I have now leapt fully into my orientation: learning Bahasa Malaysia, meeting vast verities of individuals, exploring, and not to mention some very intensive walking. Completely emerged in the Fulbright experience, finally, it has already been one of my favorite experiences in all my life. There are very few things, if any, that I have done in my past that are comparable to what I am enjoying, learning and participating in now. Every day for the last week as been heaving with the new and wonderful—those uncommon experiences of life that give vitality to even the most normal of daily activities. These memories are ones that I know I never will forget. I have completed the privileged, and actually rather lush, involvement of my first week in Kuala Lumpur. The acuteness of the senses becomes very apparent when abroad. Perhaps it’s out of one’s own natural instinct for safety in an unknown environment, but I seem to be much more aware of all sights, sounds, smells and textures than ever before in my life. There is no such thing as going through the motions in a place where you have never been before, and therefore, I have found you simply can’t afford to be anything other than wide awake during such a time. As a result, the feeling of constantly being attuned to the unfamiliar creates a sensory overload at times, but also a somewhat euphoric sense-of -self and presentness as well. Strangely, I think I feel much more alive and existent while traveling, if that were to make any sense. Regardless, I do believe this kind of feeling of originality in a place is becoming more and more rare in our quickly shrinking world. When I first arrived in Kuala Lumpur last Saturday morning I was definitely exhausted, however, there were a number of us that decided that it would be best to stay up the entire day exploring the city until nightfall and then really crash. The decision turned out to be a good one as we did some very extensive exploring of the city, walked about 15 miles, developed some blisters, attended a night market, and indecisively ate some interesting yet delicious food. That being said, my arrival in Kuala Lumpur was very much a “birth by fire” and as a result I saw much of the city and became very well acquainted with it very quickly. 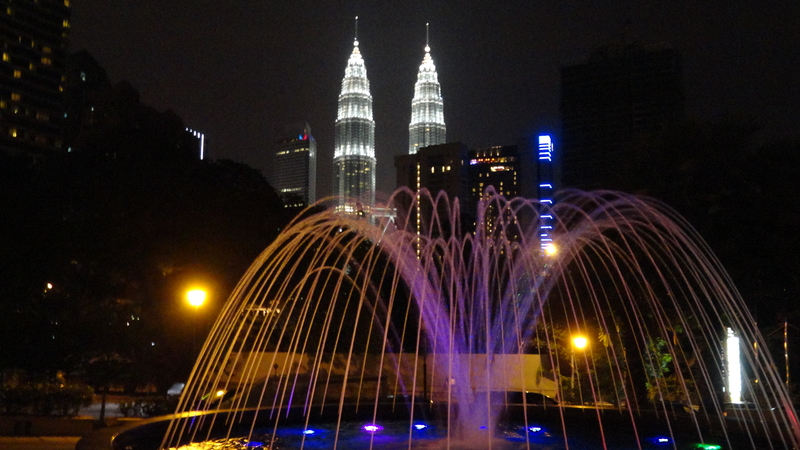 Kuala Lumpur is exceedingly diverse, energetic, strange, and interesting. Filled with almost every religious faith, ethnicity and race its population is truly unique. Also, it is quickly developing and changing and therefore is maybe even a bit clouded mystery. Walking down the city streets the people seemed friendly and busy. Some stopped to stare and notice us, but most went about their business, whatever that may be. Most businesses, however, are food vendors I would say. The amount of food stalls on the streets of this city is staggering. There is almost a different kind of food stall on every corner and usually multiple stalls on a single block. It is a wonder how all of them stay open. You would think that if one did very well the others would suffer, but that is not the case at all. All of them thrive here because to my pleasant surprise Malaysia has a wonderful food based culture. 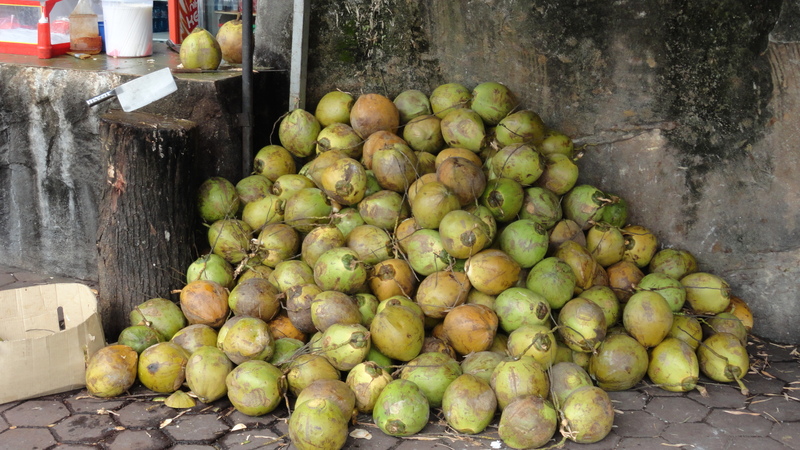 They eat all day: a couple times in the morning, a couple times in the afternoon, some tea, some coffee , more food in the evening, all followed up by some strange assortment of condensed milk drinks drunk from a straw in a bag for a nightcap. They eat so much I literally can’t keep up with it and THAT SAYS A LOT. In my attempt, however, I have managed to try some great local dishes including Laksa, Roti, Stingray, a variety of modified Indian and Chinese dishes , as well as special versions of coffee (Kopi) and Tea (Teh). I am still easing into it though. As for orientation, we are still easing our way into Fulbright Malaysia as well. Our orientation is being held at the MACEE building just a short walk from the Royal Chulan. Again, I was very surprised by the extravagance of the whole ordeal. We spend most of our day in a very nice conference room that equips us with all we could possible need for the day. We have a pretty nice schedule both primarily set up and run by former ETAs . Our first day was filled with some ego stroking and reassurance that we had made a good decision to come to Malaysia. It actually is a very cool thing that the ETA Fulbright program is considered one of the State Department’s most important endeavors in Malaysia. To make that point clear the Ambassador to Malaysia came to talk to us on Tuesday and we had the opportunity to eat lunch with him. It was a very rewarding day. He was extremely nice and gave us some encouraging words about the good we can do here. He even invited us to his house next week for tea. The following Wednesday was full of “Life as an ETA” talks and our initial class in Bahsa Malaysia; which is a surprisingly fun and a pretty easy language to learn. That says something from a guy who is terrible at languages and thinks that Hell could very well just be a place where the damned go to learn every language on earth for the rest of eternity…( I personally can’t think of too many things worse than that). The rest of the week was filled with icebreakers, very informative sessions and lectures put on by state officials and members of the U.S. Embassy about our purpose here, Malaysian life, Culture, History, Politics, Economics and anthropology. I must say that I really enjoyed the whole week and I was very refreshed to sit in class again so to speak, and get some real substantial material presented to me once again. I have to say that I have missed being a student very much, and being with such bright minds and experts in the fields of Political Science and Economics has done quite a bit to breathe life into me this past week. Other than those less exciting things, I have also received my housing and teaching information this week; the most thrilling information of the last 8 months. I have been waiting so long to know exactly what I’ll be doing and where I’ll be living that I don’t even remember what it’s like to have clue of what my future might look like. It has been almost comical how little I really knew about the specifics my next year of life. All waiting now aside I know that I will be living and teaching in small town called Maran in the State of Pahang, Malaysia. If you look at a map of peninsular Malaysia it’s basically right smack in the middle surrounded by some serious jungle and Rain Forest Preserves. There I will be working with primarily secondary 6 Form students ranging from 16 to 18 years old. I arrive at my lodging, which is a very nice (much nicer than I thought) apparent on the 25 of January. I will also not be living there alone to my relief. I have been placed in the same town as another ETA from New Jersey and who just recently graduated from Rutgers University in Philosophy and Religion. He’s a good guy and we are very excited to be living together. Many more details will come as we work out a few more things this week and meet with the Malaysian Ministry of Education before we get settled. Maran seems like a very nice little town that should have most of what we need for the year, and the ETAs there last year said that they were able to make a meaningful impact and have a lot of fun with the community. A lot can be said about it but if you really want to look into Maran and the region more check out their website. It’s all very exciting though. We all ended the week on a high note, finally knowing our destiny most were very happy with their placements and to celebrate we were invited to a Marine party at the Embassy on Friday which was very fun, and on Saturday we were sent by last year’s ETAs on a scavenger hunt to scour the city to fulfill some ridiculous tasks in order to embarrass ourselves to the locals and get to know our way around the city. On Sunday, what was intended to be a lazy day of relaxation turned into an impromptu expedition to Batu Caves with some guys from the program. 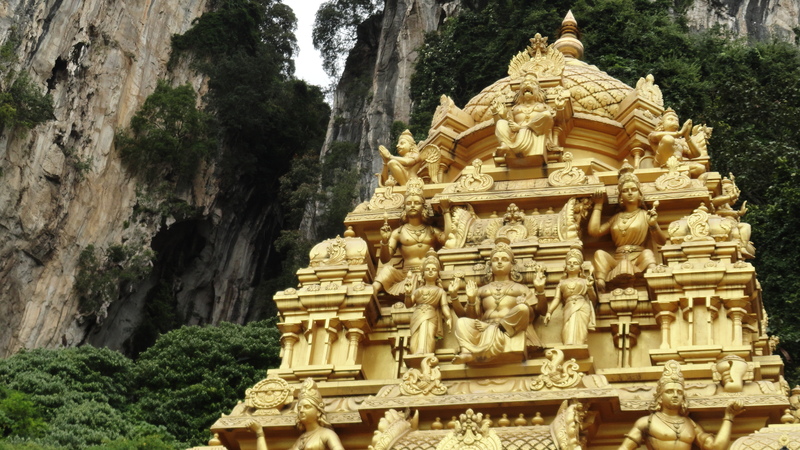 It actually only cost 2 Ringgit, the equivalent to 80 cents U.S. (the Ringgit is my new favorite currency) to get out there by train and explore the enchanting Hindu shrines that surround the monumental caves. The shrines were beautiful, but the caves and cliffs were absolutely breath-taking. After taking in the beauty of the caves and enduring the very rude, mildly terrifying and dangerous company of a gaggle of monkeys on the way up the 200 plus steps, we stopped at the National Mosque, participated in a drum circle near the National Monument, and then trudged our way back to our beds. Followed by an Embassy conducted Bluegrass/Eastern Music Fusion concert lead by Akasha, (who you really should check out) the weekend was very successful. On Saturday I got a fish spa! For those of you not familiar with Southeast Asian culture this is where you stick your feet into a bubbling pool of water and allow hundreds of little fish eat the nasty dead skin off of your feet. Pretty strange. Pretty gross. But my feet felt the best they have ever felt afterwards. Almost cute if you’re not paying attention. It was without a doubt one of the busiest weeks I’ve ever had; the kind that makes you almost certain that all of its events were not contained by just seven days, but the experience thus far has been very rich and fruitful. I know that there will be much harder times to come and that this alternate reality in which I am now living doesn’t, in anyway, reflect the struggles and hardships I will soon be facing, but for now, I will certainly take the blessings I have been giving and be thankful. Much more is to come. Posted on January 17, 2013, in Uncategorized. Bookmark the permalink. 2 Comments. Your blog is wonderful to read and follow. Those monkeys look tough. Spread your light in your new home away from home. Stay safe. Mrs. R.